This is the first game in the Star Fox series. For other games in the series see the Star Fox category. For the unrelated Atari 2600 game, see Star Fox (Atari 2600). Star Fox (スターフォックス, Sutaa Fokkusu, released as Star Wing (note that it is only written in a typeset format and unlike the Star Fox title, Star Wing's "W" is the same size as the other letters except for the first "S", so Starwing may have been the official title) in Europe (due to trademark issues) is a shooter for the SNES. It was widely praised for its 3D graphics, at the time uncommon in console games. 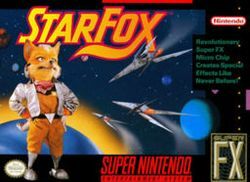 A sequel titled Star Fox 2 was soon planned and was even advertised in catalogs, but it was cancelled in favour of Star Fox 64. Several playable prototypes exist. Starwing box, front and side. This page was last edited on 5 May 2014, at 16:20.